Ainu people consider Gods are being inside of everything surround them, including animals, plants, and even artificial matters such as houses, and tools. After they ate them or use those, they make art objects called “inaw” for Gods. Then Gods brought those arts back to heaven as souvenirs. Ainu think that in this way Gods are happy with their souvenirs and will bring lucks to Ainu when they back to the ground. The thought is based on the idea of mutual aids. So Ainu consider that they are able to absorb the abilities of brown bears by eating parts of bears’ body such as eyes and brains, after they ate meat and took fur. Also Ainu people consider that Gods disguise themselves as every nature things. As Ainu think that the deities who bring lucks for Ainu also are in disguise. So they respect each and every one of things that the fortune represents to expect the return of gods. Ainu people have conducted the varieties of rituals to repeat this process. One of their rituals is for the soul of brown bears they killed. The Brown bear is ranked the highest among the mountain gods and called “Kimun Kamui”. The ritual of Kimun Kamui is called Kamui Obunire or hopunire which means sending the soul of bear to heaven. Kamui Obunire is conducted at the site of hunting ground or their village. Sometimes Ainu brought the cub of high-ranking animals including bears back to village and reared it. When the cub grew to appropriate age, it was also sent to heaven by the ritual called i-omande. Then in the course of ritual history the name of i-omande was exclusively used for the ritual of the hand-reared bear cub. There was another ritual called arupare for small animals and birds. Also the ritual called iwakute for tools existed. Through the ritual of Ainu the Gods come and go between the land and the heaven. These rituals were established by 1710. Ainu thought that there were the Gods on the head of vertebrates and in the case of bears the deity resided between ears. Meat of the bear was consumed and fur was used as an outfit for cold after Ainu hunted a bear. Then the head was decapitated and used for the ritual. The fur of ears and surrounding parts of eyes and a nose was left and rests of the parts were ripped off. Then Ainu stripped the meat off from the skull and put it with ornaments on the tree. Ainu people hunted a bear when it hibernated in the den. They poked a sleeping bear with a long stick and hit the angry bear with a poisoned arrow when it came out of the den. The hunting season was early spring and if the bear was a female there was a chance of having 2 or 3 cubs with her. If there was tree cubs left in the den, one was killed at the site because of no chance to survive for a cub without a mother and two were taken to their village. Then they were raised until fall came at the village. By then the cub grew enough to survive by itself and also it was difficult for Ainu to tame the cub. In the ritual of i-omande the cub is strangulated with a log. It is sound horrible, but it is a noble ritual for Ainu. The evidence is that Ainu grief like their family member was passed away when the cub died before the ritual. Ainu also believed that the cub brought fortune during the term of rearing. The ways of ritual style were varied among the communities and the period. Ainu had several ways of hunting methods. Sometimes they made a pitfall and wait for a bear fell in. They also chased down a bear, but more frequently they aimed at a bear in hibernation. First of all they found out the cave for hibernation, then poked sleeping bear with long wooden stick. When an angry bear came out of cave, they shot a poisoned arrow at the bear. 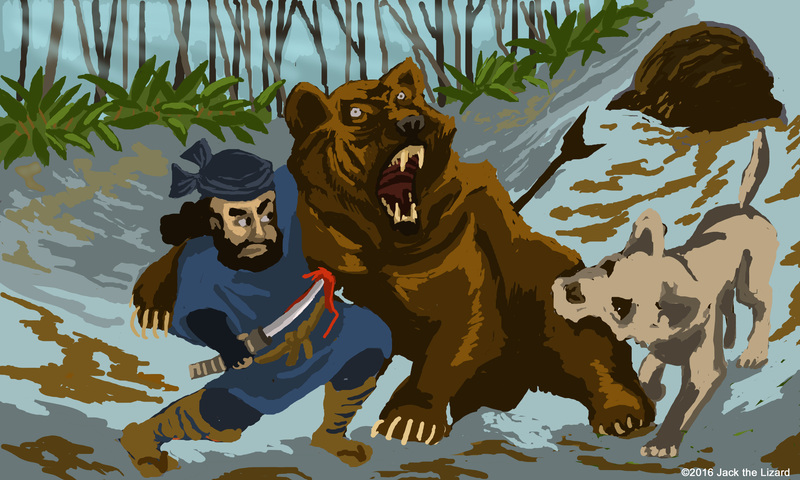 Gradually poison weakened the bear and an Ainu finish it off by stubbing its side with a hatchet. Then they torn the part of poison arrow hit off as soon as possible to prevent the meat from contamination. Ainu people cooked most part of meat but they also ate some parts of meat such as eyes, a nose, and a tongue raw, because they believed that they were able to acquire the abilities of a bear by eating those organs. For example they believed that they were able to improved their eyesight and sense of smell by consuming bears’ eyes, and a nose. Also a part of the brain is for intellectual and the blood for vitality. But they did not eat some part of body such as a stomach, the large intestine, and a spleen raw. The liver was dried and sold to “wa-jin” the other Japanese as medicine. Dogs were extremely important for Ainu and aided hunters to capture bears. Brave Ainu hunter waits for angry bear coming out of the cave and he stubs the side of bear who is in toxic with a poison arrow to finish off. From eyes of modern people the life style of Ainu is somewhat cruel and contradicted in some ways. However we cannot merely judge their way of life because they also have own rules as we have them today. For instance they had taboos when hunters went into forest. Hunters must not verbally insult and criticize bears once they entered in forest. Villagers also had the rule not to wash clothes during the hunting. Ainu believed that if somebody broke these rules, misfortunes certainly would occur. To show some respects for the Gods of mountains and sea Ainu offered parts of bear meat to these Gods when they successfully captured a bear. This custom probably derived from the idea of mutual aids between humans and nature. 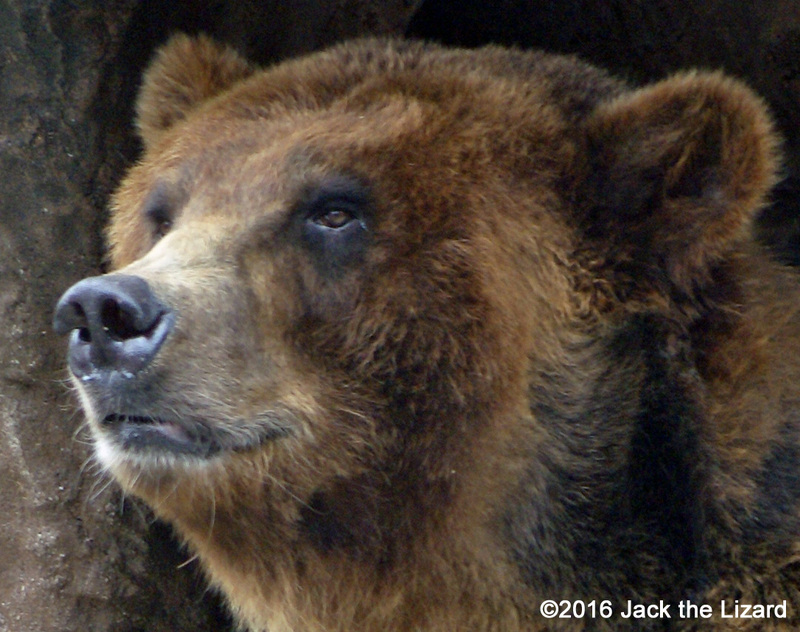 The life span of Brown Bear is about 30 years. The history of Ainu is harsh. During the Meiji era mainlander prohibited Ainu to use poison allows and fish. In addition to that their land was deprived by government of Meiji. Not only Ainu’s traditional life was gradually disappeared, but also the population of Ainu drastically dropped. Brown bears also had same history as Ainu had. The government of Meiji promoted the agriculture on Hokkaido. As land was developed by farmers brown bears lost their habitats. Inevitably conflicts occurred between farmers and brown bears. Brown bears were aggressively hunted when once they attacked humans. In contrast to the way of Ainu who hunted bears for food and use every parts of bears, the government of Meiji simply killed them to cultivate the land. 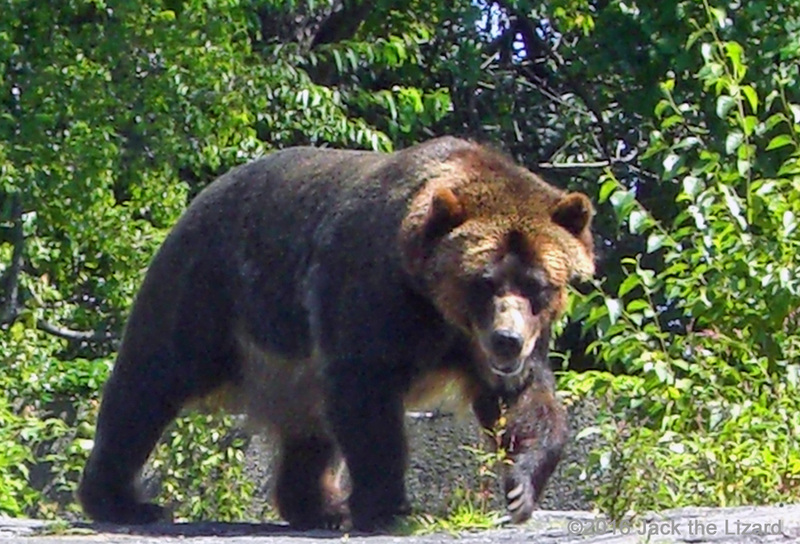 Now brown bears in Hokkaido are still hunted without reasonable cause. Dr. Kadosaki believed that brown must be respected as part of Mother Nature and humans can share the land of Hokkaido with them. “We also must preserve Ainu’s unique cultural heritage as part of true Japanese history” said Kadosaki. 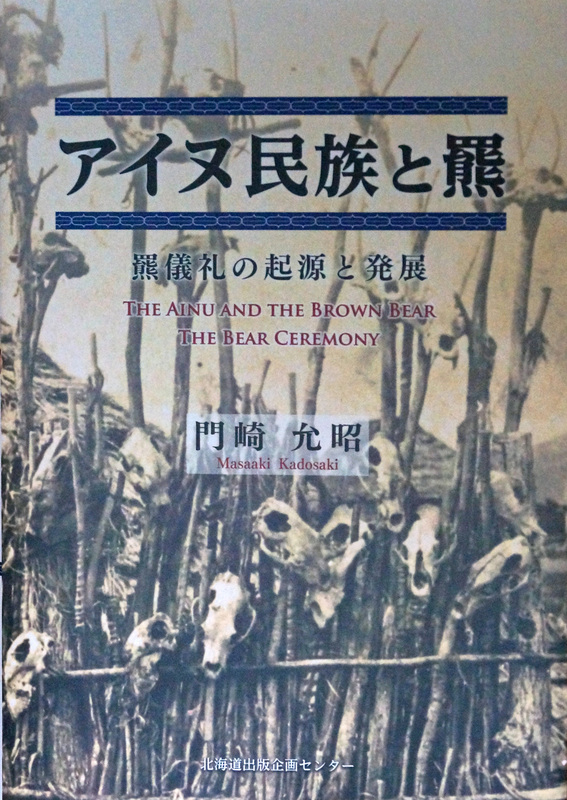 His book “Ainu people and Brown bear” includes the traditional life of Ainu and behavior of brown bears. It makes reference to the research data by Rinzou Mamiya and Kanzan Matumiya from 18th century to 19th century during the Edo era.